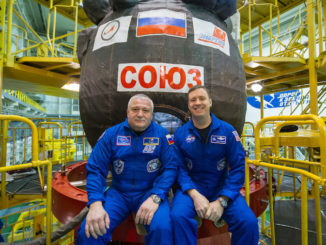 These photos chronicle the activities of Russian cosmonaut Fyodor Yurchikhin and NASA astronaut Jack Fischer on Thursday as they prepared for liftoff on a Soyuz rocket to begin an expedition of more than four months on the International Space Station. 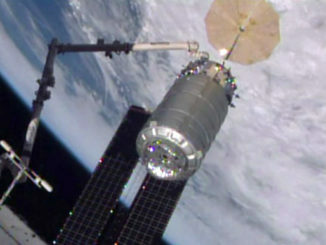 A commercial Cygnus freighter made a science-enabling delivery to the International Space Station today, bringing about 7,500 pounds of cargo to the outpost under NASA’s privatized logistics shipment program. 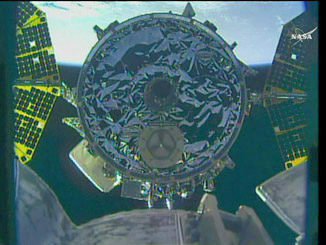 The International Space Station crew reaches out with the Canadian robotic arm and grabs the free-flying Cygnus OA-7 commercial cargo ship filled with supplies, food and science gear. 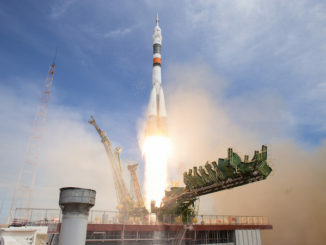 A logistics-delivery vessel for the International Space Station, launched and operated privately by commercial companies on behalf of NASA, is scheduled to arrive at the lab complex Saturday at 6:05 a.m. EDT (1005 GMT). 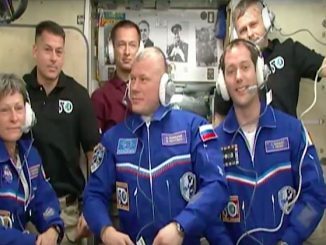 Veteran cosmonaut Fyodor Yurchikhin and rookie flight engineer Jack Fischer streaked into orbit aboard a Russian Soyuz ferry craft Thursday, chased down the International Space Station and glided to a smooth docking to complete a six-hour rendezvous. 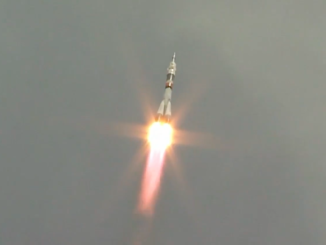 Russian cosmonaut Fyodor Yurchikhin, on his fifth trip into space, and rookie NASA astronaut Jack Fischer, a Colorado native, blasted off aboard a Soyuz booster at 0713 GMT (3:13 a.m. EDT) Thursday from the Baikonur Cosmodrome in Kazakhstan, heading for the International Space Station for a four-and-a-half month expedition. 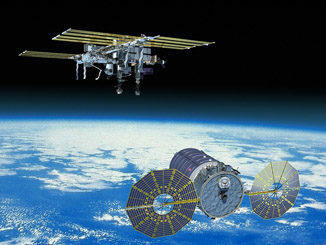 The duo docked with the orbiting outpost at 1318 GMT (9:18 a.m. EDT). 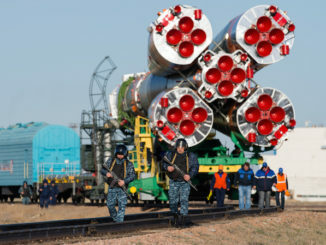 A Russian Soyuz rocket rolled to its launch pad in Kazakhstan early Monday aboard a specially-designed rail car, three days before sending a Russian cosmonaut and U.S. astronaut to the International Space Station. 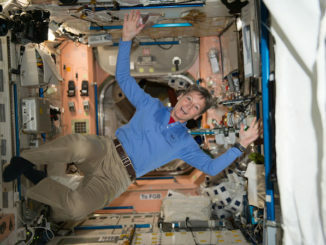 NASA and Roscosmos, the Russian space agency, have agreed to extend astronaut Peggy Whitson’s stay aboard the International Space Station by three months to enable uninterrupted research aboard the orbital laboratory during a period when Russia is temporarily reducing its crew complement, the U.S. space agency said Wednesday. 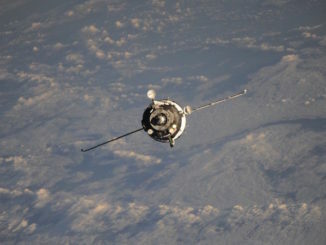 Two days after launch from Kazakhstan, a Russian Soyuz ferry ship glided to a smooth docking with the International Space Station Saturday, bringing a veteran cosmonaut, a Frenchman making his first flight and NASA’s most experienced female astronaut to the lab complex.